It came quietly, crept up on us all. Digital hit the fashion business and has shattered it into a billion fragments. The business is switching from one that has dictated for decades to one humbly trying to understand what the customer wants. Switching from transmit to receive. With the fashion business in such turmoil, brands are looking for practical guidance. This book provides that and much more. Honest, direct and courageous it’s full of insider knowledge and says things that so many people are afraid to talk about. Anyone looking to have their brand taken seriously would benefit from reading this. The Fashion Switch is an amazing and unconventional toolkit for all creative led businesses. Joanne has used her years of experience, real-life scenarios as a strong foundation to learn from. Due to technology, new trends, culture, political changes and more, The Fashion Switch provides support for the fashion industry to navigate through, how to successful and consistent. The book is educating, insightful, challenging, thought-provoking and most importantly honest! The ALIGN framework is an invaluable tool which should be implemented into fashion curriculum. I would recommend fashion students, graduates, young designers, academics, and independent brands all to read this book, as there is something for everyone to learn. A smart and essential blueprint to help build a successful and sustainable fashion business. Brilliant is an understatement. This book dissects the necessary steps every 21st-century fashion designer, entrepreneur or fashion professional that is looking to build a sustainable fashion business must have. In just her first attempt, Joanne has tackled the most challenging and daunting tasks by creating a guidebook that forces brands to have the necessary dialogue around the intersection of business, design, and technology. She convincingly illustrates through industry case studies and personal experiences the mistakes all brands make by not adapting swiftly to the digital world - regardless of company size and how all aspects of the fashion business is impacted by it. She has passionately written an analytical yet practical literary exchange between the tangible products designers make and the delicate relationship it balances through the customer experiences albeit brick and mortar and e-commerce. Kudos to Joanne for confronting the elephant in the room - now professional insiders need to buy this book and start putting it to good use. I, like many others, will be eagerly anticipating the sequel! This book provides an insiders perspective with first-hand anecdotes and advice as well as a straight-forward framework and methodology to help navigate the ever-changing environment that the digital world has introduced. It is a thought-provoking reference for those already in the business, as well as those contemplating how they might be able to get into it. It brings into sharp focus some of the basic principals that need to be in place in order to build a brand and become relevant. An invaluable guide for anyone starting a fashion business. 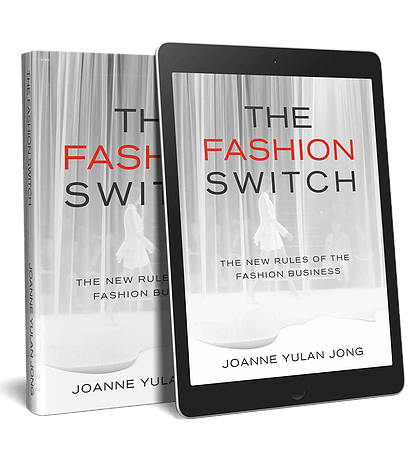 The Fashion Switch provides an invaluable and accessible breakdown of the challenges faced by business owners in a swiftly changing fashion landscape. Joanne’s ALIGN method provides a straightforward, pragmatic system for analysing your business practices, that even the most “creative” of us could master! This is a unique opportunity to mine Joanne’s vast experience in the fashion industry and should be compulsory reading for all SME’s. Having worked in the luxury fashion industry for many years, specialising in starting up new businesses and defining their strategies, this was a book I really wanted to read. Joanne has been behind the scene in this business for so long, she tackles it with gusto, and her usual distinctive flair, you will love getting an expert view on this topic. Enjoy! The Fashion Switch is the genuine article: a real ‘insider’s guide’ to the industry. If you are not already an insider, this book can help make you one. Read it now and enjoy all the great pearls of wisdom that Joanne shares, then put them into practice and make your business a success. A smart and essential blueprint to help build a successful and sustainable business in fashion.